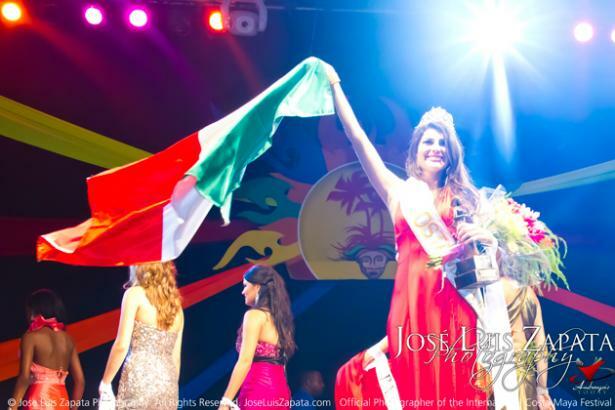 Meeting Miss Nicaragua in Belize! One of the pleasant surprises when visiting, or living in Belize, is that itÂs not unusual to encounter a famous ÂpersonalityÂ here.Â It could occur on your flight to, or from, Belize... Or you might bump into an unexpected "recognizable celebrity" while bopping around San Pedro Town.Â Take Mike Cobb, for instance.Â He recently had a memorable encounter at the Belize International airport, in line for his TACA flight.Â He met a group of Latin beauty queens, returning home after competing in the Costa Maya beauty pageant, held in San Pedro. But this is just one example.Â Some of you may watch rock star Gene Simmon's Family Jewels. Â His recent reality show special was set in Belize, and on Ambergris Caye.Â He was seen driving all around the island, with his long-term squeeze, Shannon.Â He dropped in at REICA realty, the group that represents our Grand Baymen properties. Without their makeup and entourage, sometimes itÂs hard to know if itÂs really them.Â But the sightings are always confirmed in the local media. In the future, Mike will be a guest contributor to the Grand Baymen blog.Â HereÂs MikeÂs first contribution, about his chance meeting with Miss Nicaragua, and the other lovely pageant delegates. ÂFlying back from Belize I had the opportunity to meet and talk with Miss Nicaragua,Â Gisselle de los Angeles Alvarez RamirezÂ for a while. Â She was returning from the Costa Maya Festival on Ambergris Caye Belize. Â It happened that as I was checking in for my TACA flight in Belize and four attractive ladies were in line ahead of me.Â They were hard to miss, especially because the shortest of the four was probably 5'11" and the tallest, Miss Honduras was at least 6'8", admittedly wearing 4 inch heels, but nonetheless, very tall. The Costa Maya Festival is held each year in early August and is one of the largest international festivals in Belize. Â And it all happens right here on Ambergris Caye. Â Rooms on the island are booked up and every golf cart is rented. Â The festivities start on Friday night with a beauty contest and continue through the day Saturday with lots of merry making and celebration of the Mayan heritage. Â The party continues until dawn when things start to wind down.